Okey dokey, folks, have a got a Weight Watchers find for you. 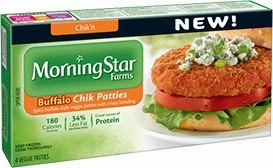 Morning Star Farms has deliciously divine veggie patties that are only 4 Old WW Points each. I cannot tell you in words how absolutely tasty they are. You'll have to eat them to believe it. I serve mine on Weight Watchers Sandwich Thins (1 Old Point) with Velveeta Original Sliced Cheese 24 Slices (1 Old Point). For zero point additions, you can add mustard, bell peppers, lettuce, and tomato. So you get all of that for 7 points! If you're following the Points Plus Program, Buffalo Chik Patties are 5 P+, Weight Watchers Sandwich Thins are 3 P+, and Kraft Velveeta Original Sliced Cheese is 1 P+ for a total of 9 P+. If you're not following Weight Watchers but are counting calories, Buffalo Chik Patties are 180 calories, Weight Watchers Whole Wheat Sandwich Thins are 100 calories, and Kraft Velveeta Original Sliced Cheese (24 Slices Package) are 35 calories for a total of 315 calories. I'm following the Old Point Weight Watchers System, and this combination has really saved me from being hungry.